Who is Harley Quinn? How did she go from being the Joker's sidekick to joining the Suicide Squad? Will she ever side with the good guys or is she a super-villain through and through? In this biography - complete with black-and-white illustrations, timelines, and character profiles - readers will learn the complete history of the Maiden of Mayhem. 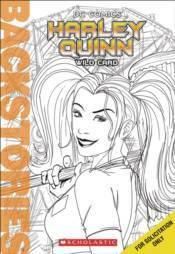 Harley Quinn: Wild Card takes the traditional digest biography series format and shakes it up for a new generation. Just in time for the new Suicide Squad movie, featuring Harley Quinn!